"This never gets old." It was day before the 2011 Badwater Ultramarathon, and, with a slight crack in my voice, those four simple words where all that I could muster to good friend Frank McKinney while standing adjacent to the swimming pool at the Furnace Creek Inn during the racers group photo. "This never gets old." Frank, a 6 time Badwater Ultramarathon finisher responded, "it sure as hell doesn't." 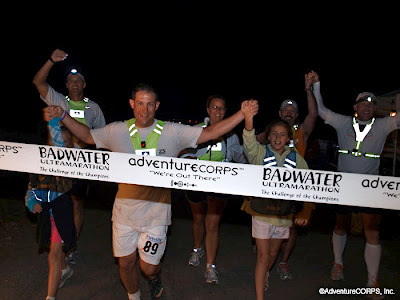 It has only been a short time since we were successful in completing our third consecutive Badwater Ultramarathon, this time in 39 hours, 59 minutes, 14 seconds.....shaving off 6 hours from our previous best finish in 2010 (45:58:15).....a short time since we left Death Valley, a place (and a race) that has become a yearly ritual of growth, internal reflection, and spiritual triumph, a place where you can literally become one with your surroundings, a place where you can forget everything, yet remember and relive so much. It is often times nearly impossible to describe in words what Death Valley and the Badwater Ultramarathon is and means on an individual level. It certainly is a place that facilitates tremendous internal reflection.....reflection that is quite life changing. The best way to understand it, to get it, to know and feel it, is to go there, and each visit, each experience, each journey, will offer distinct and separate memories, and forever impact the lives we live. Our 2011 Badwater Ultramarathon was unique and special in many ways. For the first time, my wife and two daughters would join us as crew-members (well, they called themselves "crew to the crew"). They would bounce ahead 5 miles at a time, supplying extra ice and water when needed, and, more importantly, provide an emotional boost at just the right times. They were absolutely awesome. The "Crew to the Crew"
In 2009 and 2010 we had 5 and 6 crew-members respectively, alternating in shifts of 8-10 hours each. Not so in 2011. With the family coming, we decided to go with a 3 person "main" crew, on all the time. It worked, and it worked well. I couldn't have asked for a better trio. From the moment they arrived, Eric, Jason and Chuck clicked in every way, and as a group they were the primary reason for our tremendous improvement over past years. There is no way to adequately thank them, no way to repay them for their selflessness, no way to property give them their just due. Each one of them put in nearly 40 miles of pacing and nearly 40 hours of endless waiting, all without a single complaint or negative word. The synergy was amazing. The result was spectacular. 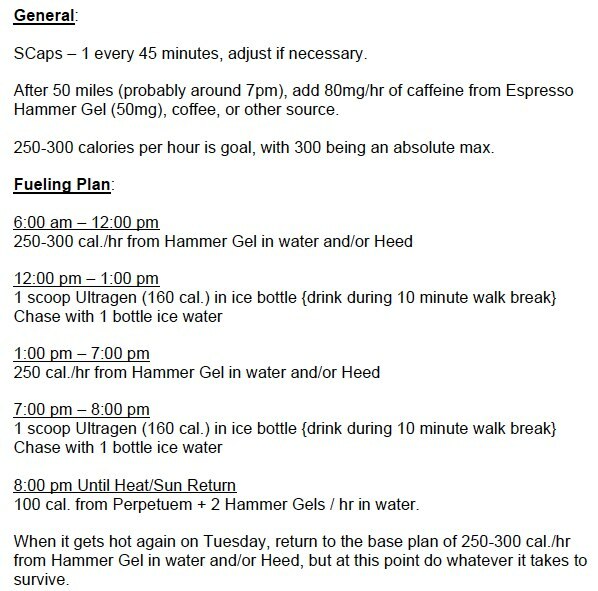 Eric put together a summary of statistics that are approximate and include the runner and 3 crew members. I can say for sure that I did not have a lick of orange juice, but absolutely drank my fair share of Red Bull. With the exception of the stretch from Panamint Springs (72.3 miles) to Darwin (90.1 miles), which took a mere 6 minutes longer in 2011 vs 2010, but was actually 40 minutes faster than our goal time, and the stretch from the Start to Furnace Creek (17.4 miles), which was intentionally meant to be 30 minutes slower than in 2010, we improved (and some times greatly improved) our times. In 2010 it took us 7:21 to get from Furnace Creek to Stovepipe Wells.....in 2011, only 5:55. Better yet, in 2010 it took us 12:53 to get from Stovepipe Wells to Panamint Springs, a section that included the 5,000 foot, 17 mile climb up Townes Pass.....in 2011, a 3 hour and 26 minute improvement to 9:27. How did we accomplish this? Sure, training/preparation/devotion. Without question, we prepared ourselves for this race like it would be our last. But, for me, a big part was a shift internally. I let go. I trusted 100 percent in my crew. What they said, I did. What they handed me, I ate and drank. 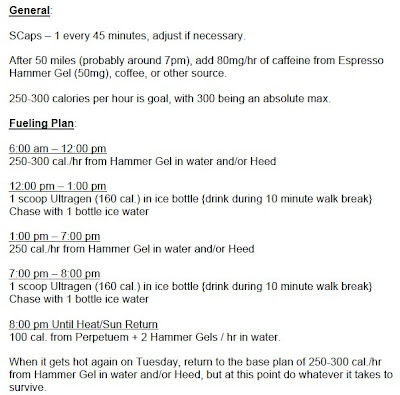 Oh, and, thanks to the great Dan Rose, we went in with what seemed to be a perfect fueling plan, one that we deviated from slightly depending on varying factors during the race. Phix Energy Drink was also an option and great pre-race wake-up. It is clear to see where the toughest parts of the race were. But, what is so great about this race is the amount of times that other runners, during our deepest and darkest struggles, took the time to try to give us a lift, to try to revive us, to give us hope. I spend a great deal of time with Frank McKinney and his amazing crew on the course. We chatted a lot. We struggled a lot. We encouraged each other and pushed each other tremendously. I will never forget the time spent with him on that road. He, like all of the competitors out there, is an incredible fighter. The guy nearly passed out twice going up Whitney Portal Road to the Finish, and thought only of finishing. Amazing. While climbing Townes Pass the leaders from the 10:00 AM group finally caught us, and each and every one of them....Zach Gingerich, Marco Farinazzo, Oswaldo Lopez, Iris Cooper Imhoff, Jen Vogel, etc.....all offered words of support, pats on the back, and hugs. I had a great back-and-forth conversation with Zach and his pacer Evan Hone in which we made a feeble attempt to analyze why we choose to torture ourselves this way every year. ...but enjoying every second of it. The first 42 miles (from the start to Stovepipe Wells) went according to plan. 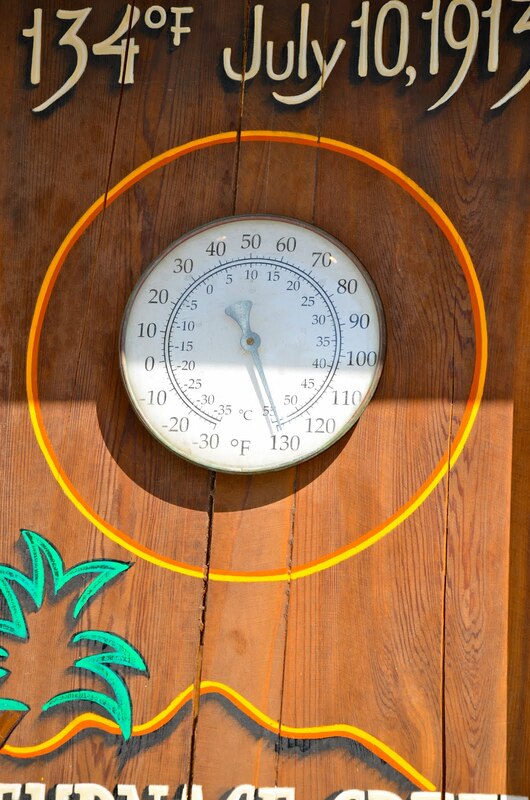 We held back in an effort to deal with the heat, and it worked. I spent a great deal of time with Frank McKinney. 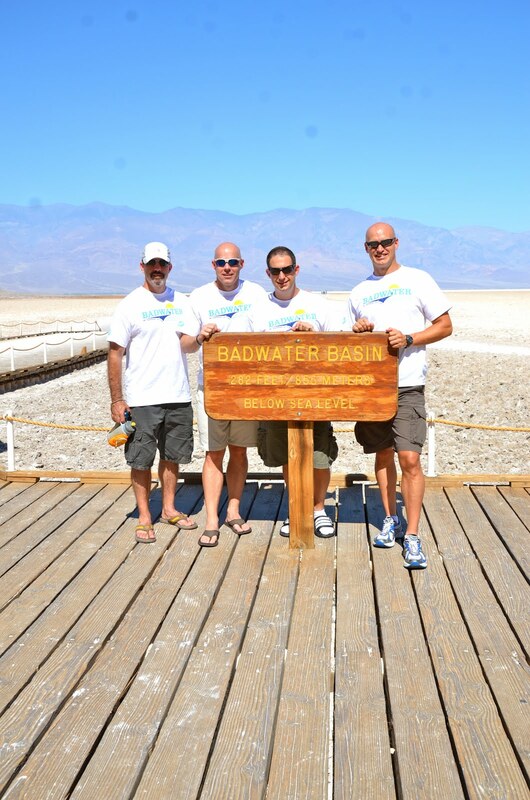 Our professional lives cross the same industry, and our personal lives are forever linked by Badwater. In the prior two years I was forced into a hotel room at Stovepipe Wells to deal with overheating issues. Not this year. We breezed right by the Stovepipe Wells check point and started the climb up Townes Pass. That climb was a struggle. It is supposed to be. 17 miles.....5,000 feet.....it is long and emotionally taxing. I believe it was some point between Stovepipe Wells and Panamint Springs that we took a short break to deal with a few blisters. Eric received a crash course in blister treatment and did semi-o.k. with the first one, but extremely well with the second. We would stop one more time to re-treat blisters, but overall blisters did not have an impact. During the climb a ton of elite athletes caught up to us, one of my favorite parts of the race. At some point Chris Roman, probably my best friend in life and my brother in running, caught us. That was a moment I couldn't wait for. It was awesome. Jimmy Dean Freeman took time to stop by and check on us, more than once. My great friends Mario Lacerda (race director of the Brazil 135) and Jarom Thurston passed by and gave me a huge boost. Seeing all of those great people made the climb to 5,000 feet a lot "easier". Reaching Panamint Springs (72.3 miles) in the middle of the night was a treat - smoothie time. I swear they have the best smoothies at Panamint Springs. It made the trek to Darwin (90.1 miles) a good one - we polished off that short section 40 minutes faster than planned. But, the arrival at Darwin also signaled daylight, and with daylight came the sun and heat. Sure enough, Darwin to Line Pine (122.3) was torture. We would continue to leap-frog with Frank McKinney and his crew. I had never gone through Keeler and reached Lone Pine in the daylight before. It was very cool to experience these portions of the race from a different perspective. In Lone Pine, I felt as if I had nothing left to give to the desert. Not only was I walking, I was walking slowly. I can do math, and it wasn't looking good at all. It was about 5:45 PM. It was still hot, at least to me, and I found myself talking out loud to the sun, begging it to set behind the mountains. It wouldn't (at least not in the time frame that I demanded). Slowly we moved up the Portal Road, each step more painful than the last. Until.....something hit me few miles into the climb that starts at 3,610 feet in Lone Pine and culminates at 8,360 feet at Whitney Portal. My wife and daughters had taken our second vehicle to the finish line to wait. At the pace we were moving, it would take us several hours to get to them. On the way to Lone Pine I told Eric that there would be no repeat of 2010's climb up the Portal Road, that there would be no running, that there would be no all-out push to finish. I was wrong, and a few "long" miles into that climb, it was time to move. And boy did we move, running and walking with a purpose to the finish line, using each vehicle returning from Whitney Portal as a spring-board to run harder and faster. Red Bull.....give me a Red Bull in a bottle. Passing the amazing Danny Westergaard, he said, "you must be the guy that just asked for Red Bull in a bottle." We exchanged words of support and parted ways. I would pass by several other runners, some inching along, willing themselves to the finish line. Finally, the finish line. 39:59:14. The great thing about finishing at 10 pm vs finishing at 4 am.....you can still acquire alcoholic beverages on the way back to the hotel. That and a hefty portion of McDonald's hit the spot. Even better, we would reflect on what we had just accomplished and what we did not succumb to. 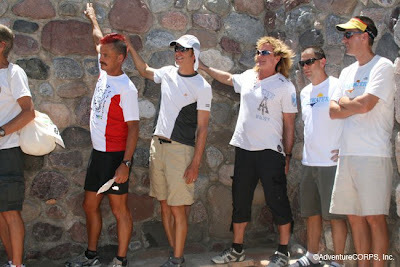 We never stopped moving, treating every step of the Badwater journey as if it were a privilege and honor. It was. It is. 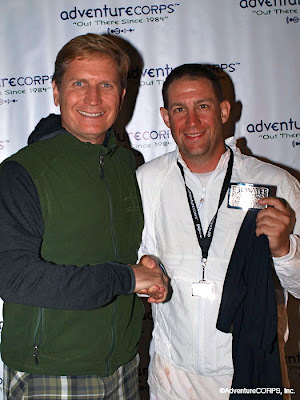 For starters, this race.....this experience.....this journey of self-discovery.....it would not exists without the herculean efforts of Chris Kostman and the entire AdventureCORPS and Badwater race staff. They are true believers in the triumph of the human spirit, and their dedication and devotion to this event and its participants is second to none. The webcast production team (Keith Kostman, Anna Leeg and Marcus Edvalson), the webcast video team (Rachel Schmitt, Lauren McMachon and Angel Rincon), the photography team (Ron Jones, Poosa Kostman, Dave and Margaret Nelson, Jimena Rodriguez), the race operations team (Mike Angelos, Jeff Bell, Ruben Cantu, Scott Dakus, Leon Draxler, Tracy Fisher, Mandy Genato, Ricky Herrera, Poosa Kostman, Joe Garza, Steve Gray, Ashley Gray, Jay Hodde, Mary Kashurba, Sophie Kashurba, Tim Kjenstad, Cory Linkel, Don Meyer, John Marino, John Marino, Jr., Scott Wall, John Wiley, Don Lundell & Gillian Robinson), the medical team (Megan Dell, Dave Heckman, Jeff Lynn, Steve Teal, Andrea Harrell and Francis Ignacio), and the foot care team (Denise Jones and John Vonhoff).....and everyone that I may have missed.....without them none of this would be possible. My crew, Eric Gelber, Jason Overbaugh and Chuck Mathison. They were amazing from start to finish, always going the extra "mile" for me to make sure this journey was successful and meaningful. Of course, the "crew to the crew", my wife and two daughters. They (my daughters) actually behaved most of the time and having my family there was even more valuable and meaningful than I could have ever imagined. 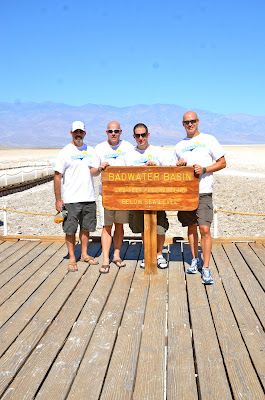 If I ever get the chance to return to Badwater I will surely beg them to make the journey with me. To everyone that contributed to our fund-raising efforts, a huge thank you! Together we raised over $32,000 for the Challenged Athletes Foundation in a very, very short period of time. However, our efforts, like our journey, does not end with completion of the race. If you can support this amazing charity, please do! To everyone that sent an email before and after the race, to all of my friends that offered their tremendous support, I thank you a thousand fold and appreciate your friendship and kindness. There are no guarantees that I will ever be accepted to run in the Badwater Ultramarathon again, which is why I treat every step out there as if it will be my last. The number and quality of applicants is growing and getting better with each passing year. I will surely apply again. I will undoubtedly keep my fingers crossed. I will always hold out hope that I will some day get to return to Badwater and continue the learning and growing process that began a few years ago. 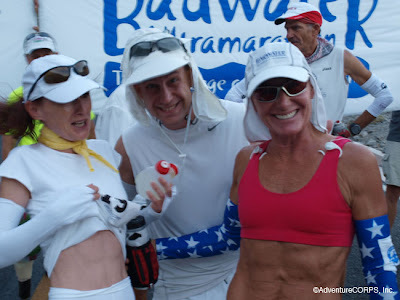 But, no matter what, I can say that without a shadow of a doubt, that the friendships and memories that have come from participating in the Badwater Ultramarathon, the lessons learned along the way, and the profound impact that it has had on me as a person and on my life, will forever be etched in my soul. "The episodes in life that last so many years in memory are often measured in fleeting minutes as they happen. In minutes, this won't last very long, but the memories sure will." The experience of the Badwater Ultramarathon flashes by in what seems like milliseconds. But, the memories and the impact it has are forever a part what shapes life in the future. Those memories will never fade. awesome report. you did so well this year and i am so proud of you!! having you at the start also settled my nerves, it meant a lot. and yes, pana mint has the best smoothies. i even sent my crew back to get me another one!! Great seeing you out there! You are tough as nails and it was good to share a few moments in HELL with you! Was tracking you, man - way to make it best year with a bang! You all must be very sick people, but aren't we all in different ways...awesomely done, perfect way to finihs too. Tony, congratulations!! Super job and a terrific write up! You capture much! I run marathons and work with Jay Hodde who was on the staff of the race...so I'm familiar with Badwater. Congrats!! Great race and excellent report - love the photos and documentation of what you/crew consumed. Awesome race report, Tony. 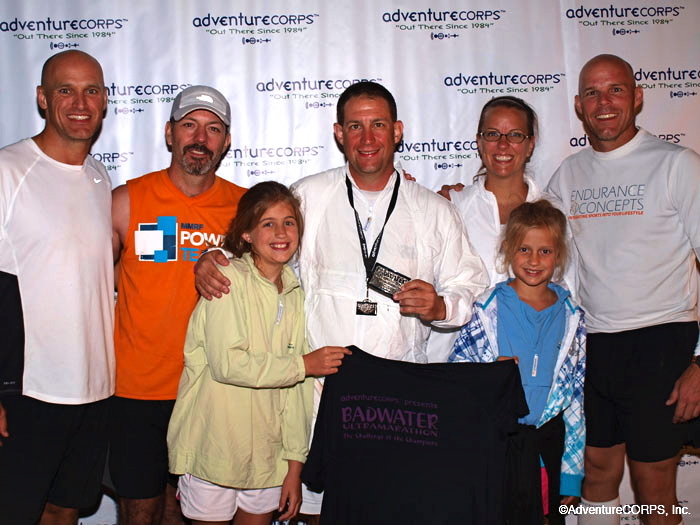 Congratulations again on your best Badwater so far. It was great seeing you again and spending some wonderful moments together out there in Death Valley. Tony, Reflecting on your race report today reminded me of all the time we spent together "out there" over the last few years, especially in 2011, between Darwin and Keeler. You are a good friend.